Are your drive-up users being heard? Engage through clear conversation with Diebold Nixdorf 816 Audio. Why should I upgrade my drive-up audio? With Diebold Nixdorf 816 Audio, you can enhance teller efficiency with the 816 Queuing Solution to show the order in which customers or members arrive to ensure everyone is serviced in a timely manner. 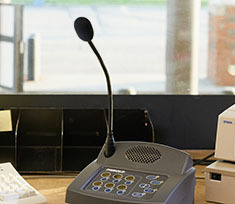 The 816 Audio System is a full duplexing system, allowing your users and tellers to have a simultaneous two-way conversation. But, okay, what does that mean? It means everyone can talk at the same time, like talking on the phone, instead of one at a time, like you were at a fast food drive-thru. The 816 Audio System eliminates annoying background noise and filters the human voice so your user can hear your teller without hearing everything else going on in the branch. Privacy headsets give your customers or members peace of mind knowing their conversations will only be herd by your tellers and not broadcast to everyone else. Request your free quote for an 816 audio upgrade today! One of our DieboldDirect Solutions sales representatives will be in contact within 2-3 business days with a quote or any questions.